Just four months ago, the fishing harbour at Kachulu on the western shores of Lake Chilwa in Malawi was bustling with fishermen and traders haggling over the catch of the day. Today hundreds of fishing boats sit marooned on cracked, dry mud as vultures fly above the shores of the once productive fishing zone 30 kilometres (19 miles) east of the southern African country's old capital Zomba. 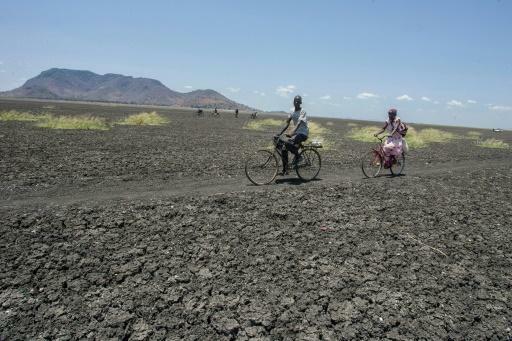 Julius Nkhata, a local villager, says the increasingly dramatic seasonal dry-out of the lake -- blamed by experts on man-made climate change -- has displaced local people and increased joblessness. "Some of them have relocated to Lake Malawi while others have taken up temporary labour jobs in the rice schemes around here," he told AFP. 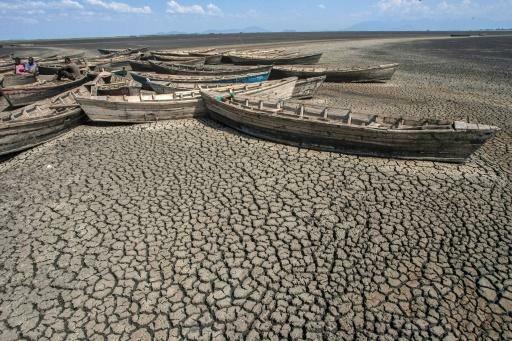 Chilwa, the country's second largest lake after Malawi, is shallow and saline and particularly prone to seasonal variations in water level and was last so dry during a drought in 1991. It is home to two inhabited islands and also sustains nearly 200 waterbird species. Environmental scientist professor Sosten Chiotha, who has studied the lake for 27 years, estimates it is now 60 percent dry. "Records show the lake has dried completely several times in the last 100 years... according to published literature, it was a cycle of 20 to 25 years," he said. But Chiotha warns that rhythm has changed. "From the 1990s, the frequency of the drying has increased and this is connected to the impacts of extreme weather events typical of climate change," he said. One-and-a-half million people live in the areas on the Lake Chilwa basin, which is one of the most densely populated areas in southern Africa. 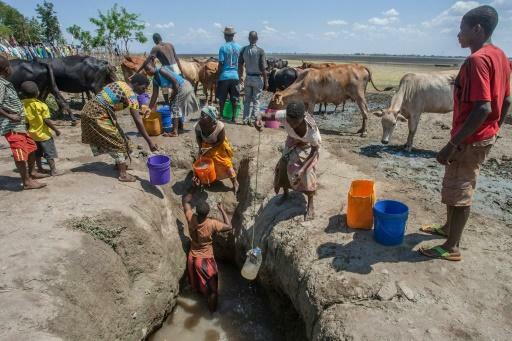 Environmental destruction has caused the underground water table to be replenished at a much slower pace, starving the lake of continuous water flow during the dry season. James Nagoli, researcher at the Worldfish action group, told AFP that the main catchment mountains for Lake Chilwa have been degraded by deforestation. "We have only one peak around January when we have rainfall but after that, you don't get a lot of flow to the lake," he said, adding farming was also pushing silt into the lake, making it shallower. "What is happening at the lake is a result of what is happening in the catchment. We need to make sure the catchment is restored." Maru Yakobe grew up depending on the lake from birth. Fishing used to earn her as much as 15,000 kwacha ($20) a day -- enough to feed and clothe her five children, and send them to school. "We used to thrive because of the lake, but now that there is no business, the devastation has not spared anyone in the village," she said. Maru now depends on a rice paddy, once a supplemental income source, for her family's survival. "It does not compare to fishing," she said. Nixon Masi, a government fishery official at Chilwa, said a women's fish-drying cooperative that depends on the lake had been devastated. "There is no fish. This has resulted in a big problem as the women from the cooperative have no source of income," he said. Of the initial 38 members, 21 have left to rebuild their lives elsewhere. "Some of these women have reverted back to poverty which is disappointing because we had been making a lot of progress," added Masi. Rose Kamata, a cooperative member, said the scheme had transformed her life. "Last year, I received a dividend amounting to 400,000 kwacha... But because we are not making any money, I withdrew everything and I am back to square one," said the widowed mother-of-eight. The lake once provided about 30 percent of the country's fish, worsening its food hunger problems. The lake's Chisi Island, home to 3,500 people, has also been hit. "Even those that tried farming did not yield anything because of the dire weather conditions," said local chief Evans Chimenya. "People on the island are desperate and life is really hard." Islanders have resorted to felling trees to make charcoal for sale on the mainland. "You cannot stop people from trying to feed themselves," he said. "If the rains do not come soon, you will start hearing news that people from Chisi Island are dying of hunger." Boat taxi operator Stephen Chimenya said he used to "make no less than 5,000 kwacha a day". "But this unexpected calamity has made most of us helpless," he said, adding he was making charcoal to earn some money. "What can we do? We have to feed our families."